John Lennon's maternal family was Welsh. His Great-Grandmother Mary Elizabeth Morris, whose family were all farmers in North Wales, was born on the family farm of Berth-Y-Glyd, in the village of Llysfaen, just outside Llandudno. At some point she met and married John Millward from Flintshire in North Wales. 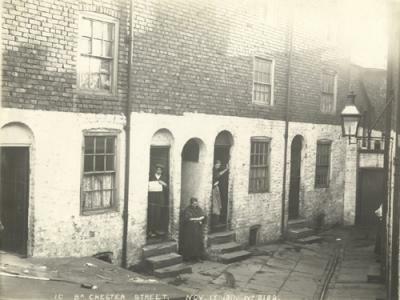 They were living in Chester, when in 1873 their daughter Annie was born in the famous Bear and Billet Inn in Lower Bridge Street. Annie Millward would be John Lennon's Grandmother. The Millwards moved to Liverpool when Annie was a small girl. Reportedly a wealthy Welsh uncle left Mary a tidy sum of money, so she bought five or six little properties dotted all around where workmen would shortly commence construction of the Anglican Cathedral in 1904. She rented these properties out and when they became vacant the Millwards would move in until a new tenant could be found. After Annie grew up and met George Stanley they continued living in the various houses and flats. The story of the Stanley legacy, actually the Millward legacy, has been told verbally by John Lennon's cousin Stanley Parkes, and in print by John's half sister Julia Baird*. The alternative theory put forward to explain why the family had to keep moving addresses is because they were on the breadline and could not afford the rent. In fact there is no hard evidence supporting either explanation. Is it possible perhaps that the legacy story was told to save face whenever one of the kids asked why they had to move house again? Maintaining the right public image to give the impression that they were of a higher class than their neighbours was certainly a Stanley trait as Julia Baird's book confirms. Annie's future husband George Ernest Stanley was born in 1874 in the Shaw Street area of Everton. John Lennon would know him as "Pop" Stanley. How he met Annie Millward is unclear but what is known is that by 1899 they had produced their first child and uncommonly for the times, did so out of wedlock. What was common at that time was the heartbreak of infant mortality. Sadly their first two children died, Charlotte Alice in April 1900 (age 9 months) from pneumonia, and their only son, George Earnest in April 1903 (aged just 3 months) from indigestion. Both children were buried within the grounds of St James Cemetery, just two of the 57,774 laid to rest between 1860 and 1936 in what was then the Liverpool's city cemetery. Thankfully over the next ten years they would produce five healthy daughters. 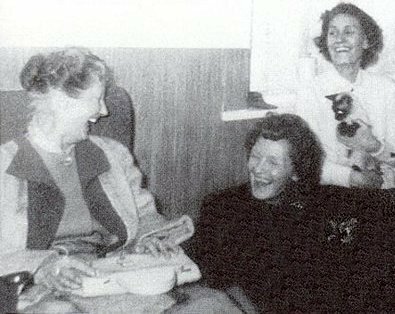 As a consequence of their living arrangements the five Stanley sisters were all born at different addresses. Their third child, Mary Elizabeth Stanley (John's Aunt 'Mimi') was born on 24 April 1906 and baptised at St James Church just under a month later on 23 May. At this point the Stanleys were living at 21 Windsor Street, a short walk from the church but they were not here long. When George and Annie were finally married at the Liverpool Parish Church, St Peter's in Church Street, on 19th November 1906 they had moved to Cornwallis Street close to the Public Baths. 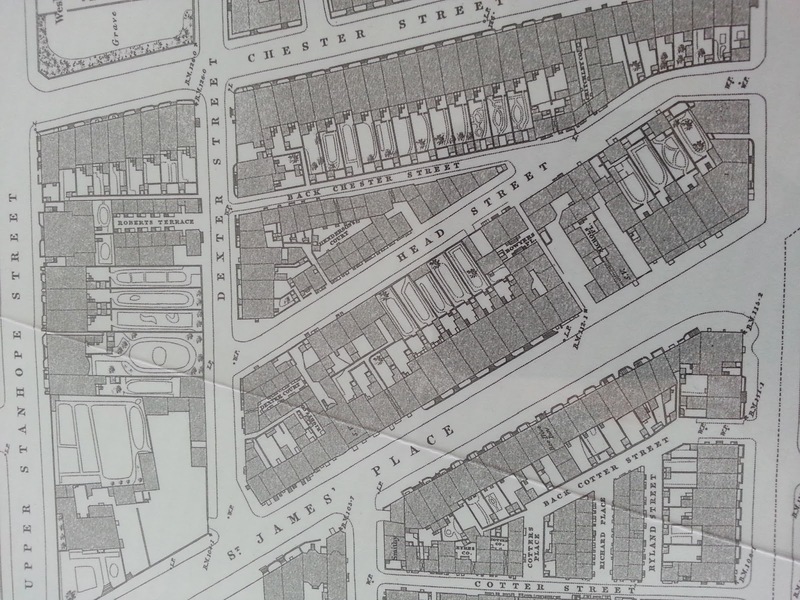 In 1908 whilst living at 5 Everson Street, Annie gave birth to another daughter, Elizabeth Jane on 29 November. She was baptised at St James Church ten days later. To John and his cousins she was known as 'Mater'. Annie ('Nanny') was born in 1911, Julia ('Judy', John Lennon's mother) in 1914 and finally Harriet ('Harrie') in 1916. 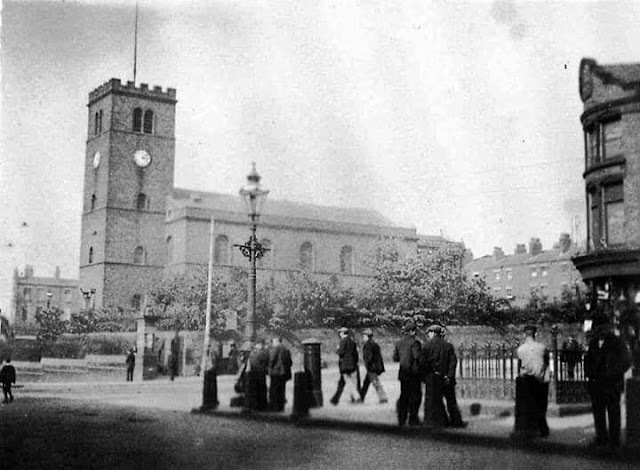 St James Church, where the Stanley daughters were baptised, is located in St James Place on the corner of Upper Parliament Street and Park Road, within walking distance of whichever property they happened to be living in at that time. The church was built in 1774–75 by Cuthbert Bisbrown, who also probably also designed it. The land was presented by Lord Sefton and the church, which costs £3000 was paid for by local shareholders. It was opened for its first service on June 4, 1775. The timber roof was added in 1846 by William Culshaw. The chancel, designed by H. Havelock Sutton, was built in 1900. At its peak in the late 1800s the congregation of St James was so huge that there were 1,000 children in the Sunday School! To local historians St James is of huge interest as one of the oldest standing churches in Liverpool. The architectural style of the interior is 'conventionally Georgian'. There are galleries on three sides, carried on slim quatrefoil cast iron columns said to be the earliest remaining examples in the whole country, which is why I was keen to visit it when it was opened to the public during September's annual Heritage Weekend. Cast and wrought iron were to revolutionise the architecture and engineering of the 19th century and at St James we can see, in embryo, the start of the giant leap into vast light fireproof prefabricated structures, technology employed locally with great success during the construction of Liverpool's docks. The church of St James has often been referred to as ‘the slave church’ as many of the 27 shareholders who contributed to its cost were merchants engaged in the slave trade. Inside the church there are 19 monuments dating from the late-18th and the early-19th centuries, many to the memory of people connected with the slave trade. The burial registers of St James feature the names and origins of people from all over the world, including several who were black, buried without discrimination alongside each other in the church grounds. 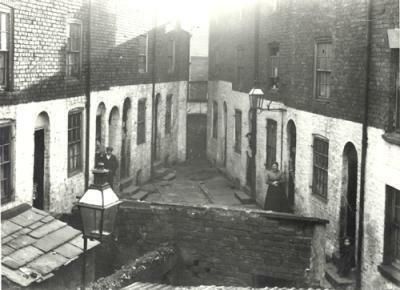 From about 1900 the graveyard was closed for internment and part of the land was used to widen St James Place. The remaining part of the yard was subsequently grassed over, which is how it remains today. In the east window is stained glass designed by Henry Holiday, dated 1881. On 1 October 1974 the church was declared redundant, and on 9 June 1976 was vested in the Churches Conservation Trust. At one point the church was to be demolished to make way for a new motorway and ring road, plans which saw the demise of the David Lewis Theatre close by. Luckily the planned road improvements were never made and St James was saved . In May 2010 the church was returned to the Liverpool Diocese and re-opened as the Church of St James in the City. As it was in a "semi-derelict condition", a marquee was erected within the church to allow the resumption of worship. Repairs are being undertaken to secure the church's structure but as with the restoration of any historic building this will take time and a lot of money. John Lennon's mother Julia was born on 12 March 1914 at 8 Head Street***, five months before the start of the Great War. At the time of Julia’s birth this was an area of poor quality dwellings as these photographs illustrate. 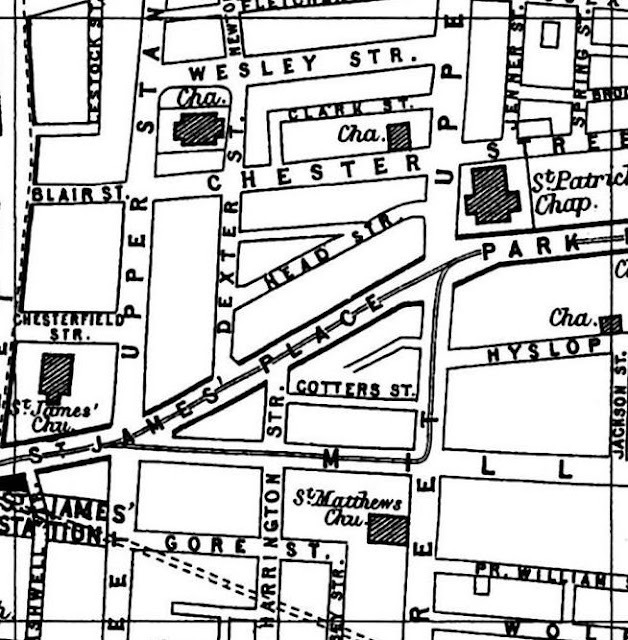 The maps show Head street consisted of back to back buildings of mixed height, squeezed into the landscape between Chester Street and Dexter Street. Atrocious court housing, tiny yards and workshops. bookended by the Anglican church of St James and the Catholic church of St Patrick. Head Street (1968) looking towards St Patricks Church. The same view (2015) is shown below. Julia's house would have stood bottom right on the new photo. Of course, by then the Stanleys had left Head Street. They moved several times after Julia's birth, spending much of the post war 1920s living at 23 Cedar Grove off Lodge Lane. 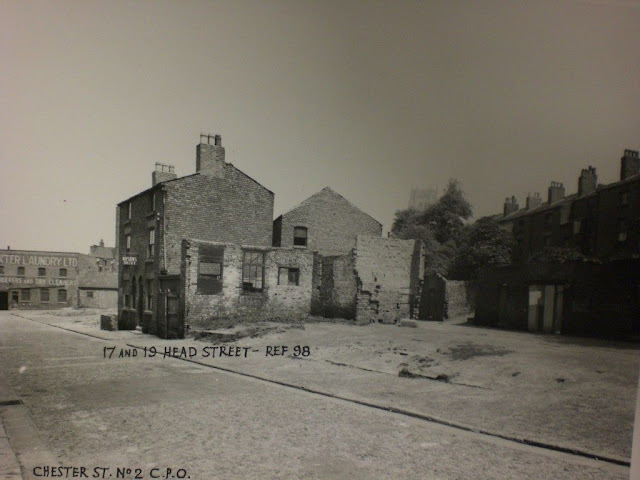 By the 1930s they had resettled at 71a Berkley Street, around the corner from Upper Stanhope Street. The outbreak of war in 1939 saw the family move again, for the first time away from Toxteth and the nearby docks to Wavertree. Berkley Street features again later in the Beatles' story. I'll cover that in a future post. ***33 Head Street, according to Mark Lewisohn's Tune In. ** Alois Hitler and his family lived at 102 Upper Stanhope Street. Adolf Hitler is rumoured to have stayed with them here during 1912-13. The house was destroyed in the final night of the Blitz and the area is now landscaped. 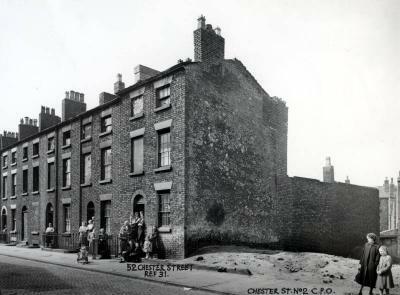 Another view of Chester Street at the time Julia Stanley was born. Legal: Please note. This blog is for historical research only, and is strictly non-commercial. All visual and audio material remains the property of the respective copyright owner, and no implication of ownership by me is intended or should be inferred. Any copyright owner who wants something removed should contact me and I will do so immediately. Alternatively, I would be delighted to provide a credit. The writing is by me, such as it is, unless otherwise stated, and this is the only Beatles and Liverpool related blog I am responsible for. Comments: Comments are moderated. Any genuine comments are welcome. However, offensive comments / advertising/ trolling/ etc are not, and will be rejected. Due to the aforementioned, anonymous comments are no longer enabled. Comments are the responsibility of the individual commenter. They do not necessarily reflect my own. M.P. Ashworth (unless otherwise stated). Awesome Inc. theme. Powered by Blogger.